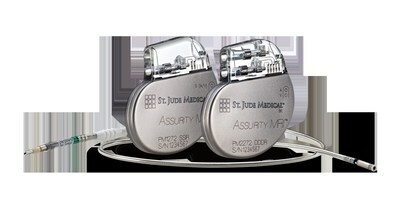 FDA approved the MR-conditional labeling for both the Assurity MRI pacemaker and the Tendril MRI pacing lead, removing a major overhang problem that Abbott inherited from its recently closed acquisition of St. Jude Medical. FDA approved Abbott's Assurity MRI pacemaker and Tendril MRI pacing lead for MR-conditional labeling. The approval fills an important gap in the cardiac rhythm management portfolio Abbott inherited from its recent acquisition of St. Jude Medical. Abbott CEO Miles White knew when his company acquired St. Jude Medical that the deal came with an overhang in that St. Jude had not yet caught up to peers in the cardiac rhythm management sector who already had MR-conditional pacemakers on the market. But he assured analysts during the company's fourth-quarter earnings call that FDA approval of the MRI claim was expected "very shortly." Sure enough,that concern was alleviated Wednesday with the news that FDA approved the MR-conditional labeling for both the Assurity MRI pacemaker and the Tendril MRI pacing lead. Li Jin, an R&D manager at Abbott, will talk about developing design requirements to ensure user needs are met in product development at MD&M West, Feb. 7-9, in Anaheim, CA. "The good news is we've seen in other markets around the world when they've gotten their MRI claim, they have recovered and restored whatever position they have lost," Miles said during last week's earnings call. "That's obviously been an overhang for [St. Jude] for this last year and the fourth quarter was no exception." The approval means patients implanted with the devices will be able to have full body MRI scans if necessary. According to Abbott, the Assurity MRI device is now the world's smallest, longest-lasting wireless MRI-compatible pacemaker. The device is designed to allow doctors to monitor patients remotely by accessing diagnostic data and daily device measurements, reducing the need for in-office visits. Pacemakers that allow patients to undergo MRI scans have become an important advancement for patients who may need an MRI in the future but do not want to risk damage to their implant. During an MRI scan, the Assurity MRI pacemaker works with Abbott's MRI Activator handheld device to trigger pre-programmed MRI settings appropriately tailored to individual patients, Abbott said. This unique technology can help eliminate the effort, time, and patient inconvenience commonly associated with conventional pre- and post-scan pacemaker reprogramming. "A long-lasting and small wireless pacemaker that allows patients to undergo MRI scans is an important step forward in growing our available treatment options for patients," said David Sandler, director of electrophysiology at the Oklahoma Heart Institute in Tulsa. "The ability to choose a device to best address a patient's cardiac condition no longer has a tradeoff with MRI compatibility. It's the best of both worlds."